The Bengals seemed to be riding high following last weeks win over the Jaguars. They played Sunday at home vs the Dolphins like a team that was flat and was ready for a letdown, falling to the young Dolphins 17-13 to fall to 3-2 on the year. Mike Nugent missed a 41-yard field goal with three minutes remaining in the fourth quarter, and the end for the Bengals came after they got the ball back with 1:45 to play, but the Dolphins prevailed when Reshad Jones picked off Andy Dalton at midfield. Dalton was only 26 of 43 for 234 yards with three sacks and two interceptions against the league’s toughest run defense. The Bengals had averaged 33 points during a three-game winning streak, but were held in check most of the day by the young Dolphins, who seemed ready to play following two straight OT losses to the Jets and Cardinals. A 1-yard touchdown run by Daniel Thomas put Miami up 7-6 with 6:54 to play in the second quarter. 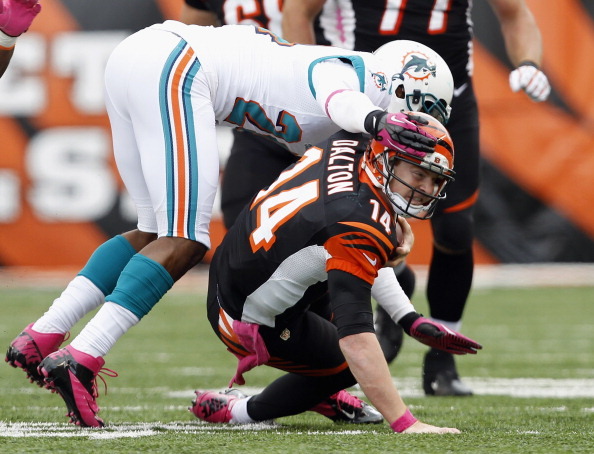 Miami QB Ryan Tannehill set up the score with consecutive completions. After hitting Charles Clay for 24 yards on 3rd-and-10 from the Cincinnati 43, Tannehill threw a 13-yard strike to Anthony Fasano. Later in the first half, Jorvorskie Lane was stuffed at the line of scrimmage on 4th-and-1 from the Cincinnati 38 after the Dolphins’ defense had recovered an Armon Binns fumble. Following the break, Dalton completed each of his first two passes, but Miami defensive tackle Randy Starks hauled in a dart thrown by the Cincinnati QB and the Dolphins began their next drive at the Bengals’ 36-yard line after a modest return. Flushed from the pocket, Tannehill found Davone Bess for a 28-yard gain and Bush went around the left end and bolted for a 13-yard touchdown on the next play. Dan Carpenter kicked a 46-yard field goal to extend Miami’s lead to 17-6 with 8:35 remaining in the third quarter. The Dolphins’ next series ended with Carpenter missing a 53-yard attempt. Top Bengals playmaker receiver A.J. Green finished with nine catches for only 65 yards, including a 2-yard touchdown. Cincinnati had to settle for a pair of field goals in the first half. Miami’s defense held on a first-and-goal from the 4-yard line. Next week the Bengals play at Cleveland, who lost to the Giants Sunday and are 0-5.